Hua Hin is an endearing town on the coast of Thailand. The warm humid location sits along the quiet waters of the Malay Peninsula and close to the city of Bangkok, making Hua Hin easily accessible and the perfect beach vacation destination. Although a laid back town, there is still an abundance of things to do, from a multitude of water sports, fishing charters, pony rides to discovering the Buddhist temples. Practice your golf swing, as you won’t find as many golf courses anywhere in Thailand, many with relatively inexpensive green fees. 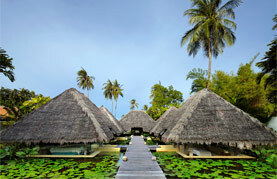 Indulge at the day spas for a traditional Thai massage or luxurious skin treatments. Foodies consider enrolling in a cooking class in one of several schools. Shoppers will enjoy the multitude of local crafts on sale at the markets.